In the post 9-11 era, it's impossible to overstate the importance of keeping US and Canadian borders and ports safe. Yet the US Government's mandate to inspect 100% of cargo at ports and borders (a significant increase from the previous target of 3%) poses a serious challenge to commercial efficiency. To give you an idea of the magnitude of cross border commerce in the United States and Canada, commercial cross border traffic accounts for approximately $1.6 billion in revenue daily - $900 million worth of goods crosses the Ontario-US border alone. At the same time, 890 million tons of waterborne goods arrive at US ports annually, representing a value of approximately $800 billion. Even if it were possible to open and inspect every container passing into the US, the resulting delays at the border would have a detrimental effect on the economy. In fact, lengthy delays at the border can result in shrinking profit margins for America's major industries - which can in turn lead to job cuts. As Stephen Flynn, director of the Independent Task Force on Homeland Security Imperatives, explains: "Security is a significant concern up and down the supply chain. Any uncertainty about the security of a shipment means shutting down a supply chain, which has economic impact worldwide." cStar's SkyGate® Cargo Secure solution represents a technological breakthrough that can help governments and commercial enterprises solve supply-chain security problems. Because it's impossible to open and adequately inspect every container that arrives at a US port or border, SkyGate® Cargo Secure provides supply chain agents with the information they need to make intelligent risk assessments early in the inspection process. Taking advantage of cStar's exceptionally cost-effective pRFID Stealth tag, SkyGate® Cargo Secure alerts customs inspection agents if shipped goods have been tampered with or subject to any other suspicious activity prior to arriving at a port or border. 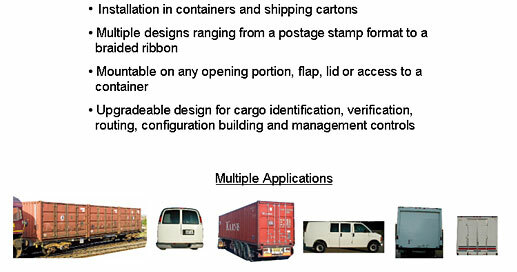 SkyGate® Cargo Secure solution is an entirely feasible wide-scale investment for shipping companies, signalling a new era of technologically enhanced security.